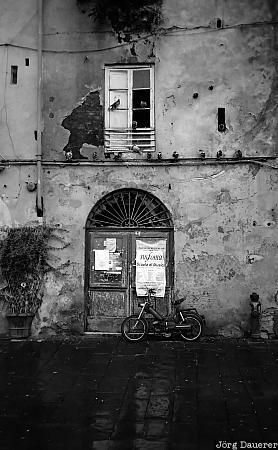 A a moped (Motorino) leaning against the facade of an old house at Piazza Anfiteatro in Lucca. Piazza Anfiteatro was built around the remains of an old Roman Amphitheater. Lucca is in the northern part of Tuscany in central Italy. This photo was taken on a rainy day in October of 1998.